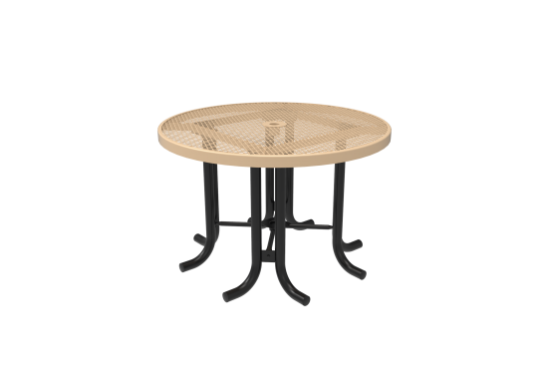 The Diamond Pattern Round Patio Table with no Seats is a perfect outdoor table for nearly any situation. Its circular design places everyone close together while offering them plenty of space for activities, and does not firmly limit the number of people at the table in the way that a square table does. It has a versatile portable base which allows it to be easily placed anywhere and moved whenever it needs to be. The high-grade steel formed into repeating diamond shapes, which makes up the surface of its table top, is very lightweight while still being exceptionally durable. 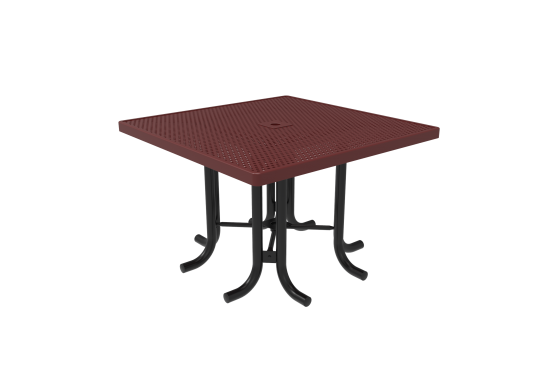 This allows the table to be transported with very little difficulty at all. The hole in the center of the table allows for the placement of an umbrella for shade, and our circular Patio Style Umbrella looks great above it. We even offer different colors to match the hue of your umbrella.